This is the first in a series of 7 lectures sharing the amazingly rich culture and incredibly signiﬁcant history of lives in the Boyne valley of Ireland for over 6000 years. This session addresses who the Celts were and what monuments and text they left for us. 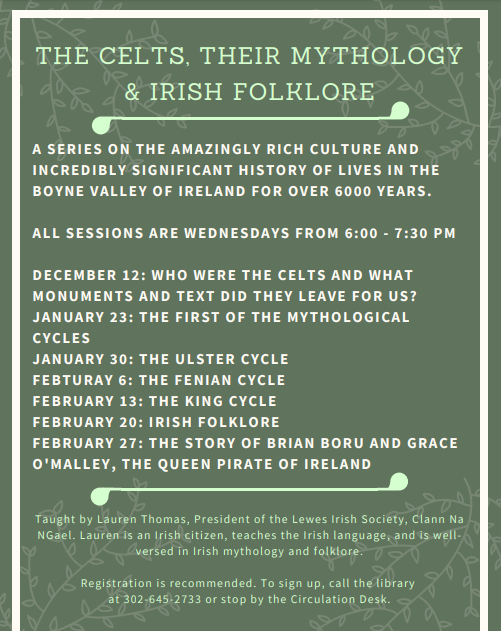 Taught by Lauren Thomas, President of the Lewes Irish Society, Clann Na NGael. Lauren is an Irish citizen, teaches the Irish language, and is well-versed in Irish mythology and folklore. Registration is recommended. To sign up, call the library at 302-645-2733, or stop by the Circulation Desk.